I don’t have a foot callus, but many people do unfortunately and they can also have hard, dry skin on their feet, this pedicure callus remover and skin softener is perfect for grinding the dead skin away whether you have a callus or corn on your feet. Normally these home remedy products sell for quite a price in the likes of the high street brand stores, but this one, by a brand called O’Vinna is less than twenty pounds when bought online at your favourite well known website which used to sell a lot of books if you know what I mean! 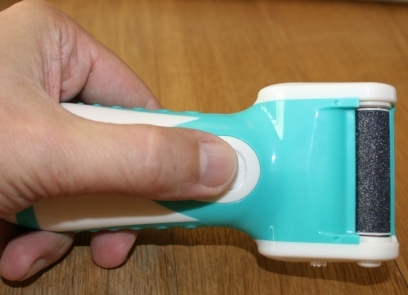 Made in glossy, shiny plastic, the callus remover is coloured a light blue and white and is ergonomic in design making it easy to grip as you exfoliate the dead dry, cracked skin on your feet. A quick press of the power button and the battery powered motor rotates a grinding wheel at high speed (nothing scary) which you then move smoothly across affected areas gently applying a slight pressure until the very top outer layer of dead skin cells start to detatch revealing softer skin underneath. You will see what happens because its like dandruff everywhere – make sure you put a towel down. Here is the full home remedy callus removal and pedicure package as it arrives (there are also instructions in the form of a booklet). As shown, you get the actual pedicure machine, a small plastic brush to clean off dead skin from the sanding wheels and also to dust the actual device after use, a protective cover which fits snugly over the currently installed wheel and a set of four barrels / wheels which have two different grades of roughness on them (two of each kind). One for heavier jobs whereby lots of skin has to be removed in bulk, and a finer blue one which is used for that extra smooth feet finish. The abilty to grip the handle firmly whilst applying pressure to the sander is important as you do not want to be slipping and dropping it. 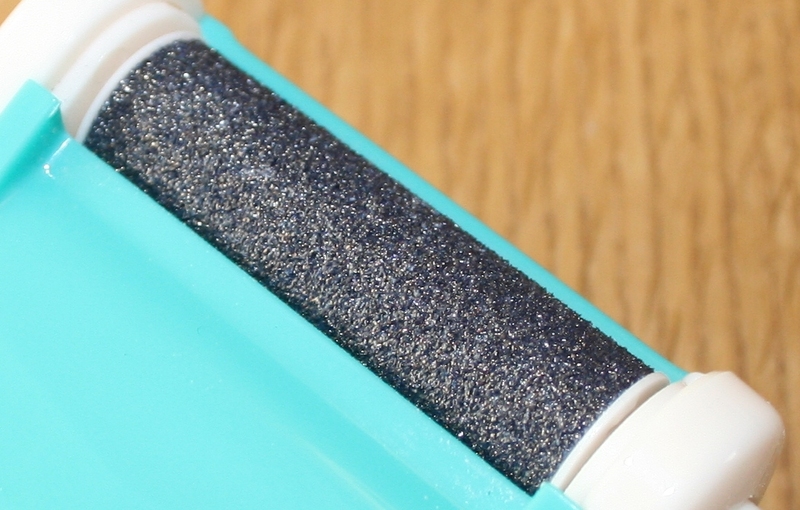 This is the purpose of the rubber grips on either side of the handle which negate the overall smoothness of the callus remover. 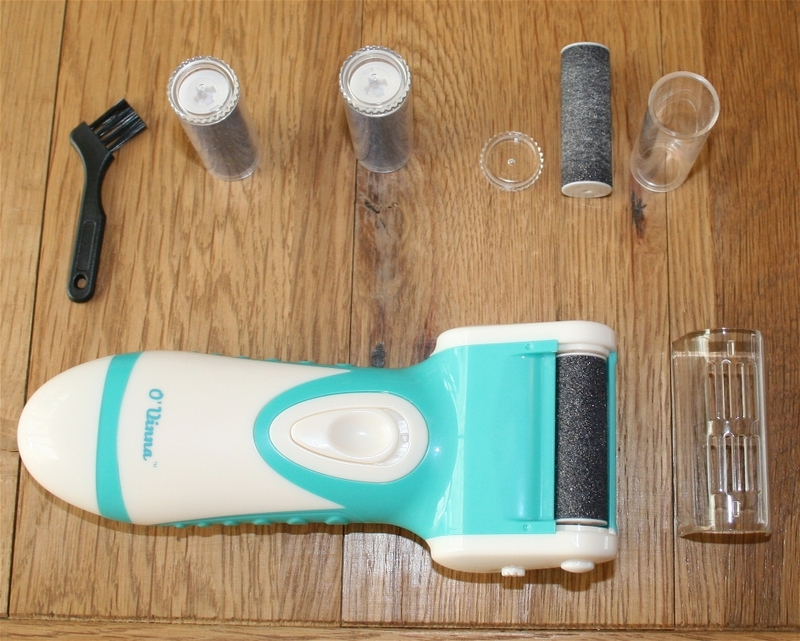 Lets take a closer look at how rough the pre-fitted sander is, you can see for yourself how it will easily remove dry dead skin from around your heel and ball of your feet. I would personally use this on myself and trust it to remove skin from my foot – but gently and carefully and not if it looked sore, open, red or anything – only when the white dead skin needs peeling. You must always check with a doctor first if you think you have a problem area on your feet before you apply any home remedy, and you must certainly check with a doctor before using this item on yourself – be specific and inform him or her of your exact intentions and establish whether or not this item is suitable for use with your condition and in conjuction with any other medication or treatment you are taking. Once used, the grit on the barrel will turn skin coloured where it has rubbed over the area to be smoothed off. This is just dead skin but remove the grinder from the handle and clean it before packing it away in order to have it ready for the next time you need to use it. It is also good hygiene practice to keep your products free from biological waste material before storage. 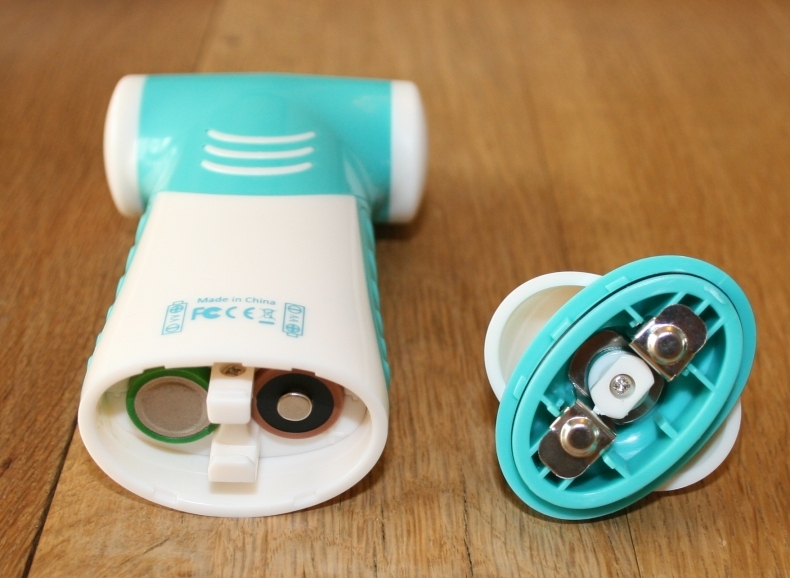 It takes two AA batteries which provide the motor with more than enough power to spin rapidly and removal of the skin takes seconds – see the battery compartment below. You cannot place the end on the wrong way round, it has 3 notches on one side and only two on the other. I haven’t got round to counting the RPM of the motor on this electric skin sander, so instead I thought this is a good opportunity to present a quick video. Now not many people would enjoy seeing someones skin flying off feet in order to demonstrate a product, and trust me – fly off is exactly what it does. Instead here is a quick look at the kit and the motor in action in a short video so that you know what to expect when you first switch it on.